There are a lot of things to do in Canberra - the capital of Australia. With no ocean breeze or skyscrapers, lots of symmetry in the city planning, and the Parliament House up the hill, Canberra is different from all the other cities in Australia. But it is a great city to visit, with some great museums and art galleries, lots of green parklands, and compared to most other cities, a friendly feel about it. In the early 1900s after Australia’s six colonies had undergone federation and become the same country, the big question was where to put the new capital of Australia. As a result of heated debates about whether it should be Sydney or Melbourne, Canberra was built in the middle of the two, to become the new capital of Australia. The American architect Walter Burley Griffin won the competition to design the city, and construction works started literally in the bush. With an exception of a few old cottages that happened to be in the area and were preserved, there are no historical buildings or “old town” (like The Rocks in Sydney) in Canberra. Australian Government moved to the new capital in 1927, and today Canberra is home for 300,000 people. The Old Parliament House was the seat of Australian Government until 1988. Today you can wander through the rooms of the Old Parliament House, including the suit of prime minister, or check out the House of Representatives. There are free guided tours almost every hour, and there is also a portrait gallery. The Old Parliament House. By AllPosters. Click on thumbnail to buy. The new Australian Parliament House was built on the Capital Hill and in 1988 it was ready for the Government to move in. It costed $1.1 billion and contains 4700 rooms decorated with both modern and Aboriginal art. You can go in the new Australian Parliament House and walk around there by yourself, watch the public galleries and check out the Senate Chamber and the House of Representatives. There are also guided tours in the Australian Parliament House, 45-min when the parliament is not in session, and 20-min on the days it is. The Parliament House. By AllPosters. Click on thumbnail to buy. Across Lake Burley Griffin, in the end of the Anzac Parade with 11 smaller memorials, is the Canberra War Memorial with a war museum in the Anzac Hall, and more war memorabilia such as army aircrafts and machinery in the Aircraft Hall. 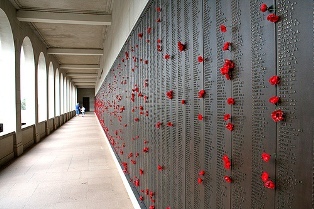 Among the Hall of Memory’s mosaics is the tomb of Unknown Australian Soldier, memorising all Australian soldiers killed in wars. Between the Parliament House on Capital Hill and the Anzac Parade is the National Gallery, with artworks ranging from Aboriginal and Torres Strait Islander art to the artworks of modern artists, including paintings, sculptures, ceramics and silverware. There are guided tours twice a day in the National Gallery, and there is also a tour that focuses on Aboriginal art. On the other side of Commonwealth Avenue and Lake Burley Griffin is National Museum of Australia, covered in abstractive modern art on outside. 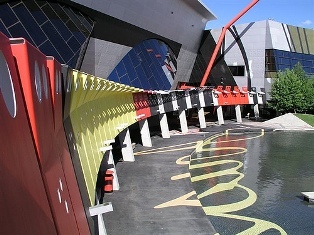 Inside you find yourself amongst creative and humorous displays and exhibitions – the National Museum of Australia is a different museum to say the least. Lake Burley Griffin, named after Canberra’s architect, is the central feature of Canberra, with black swans in its waters and lots of parklands and walking trails along its 35km-long shoreline. In the middle of the lake is the large fountain called Captain Cook Memorial Water Jet, built in 1970 to celebrate 200 years from Captain Cook’s first landing in Australia. 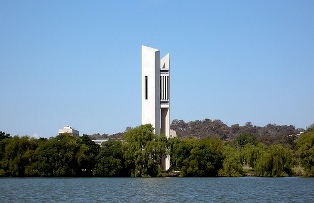 On Aspen Island is the National Carillon, Canberra’s 50th-birthday present from Great Britain. 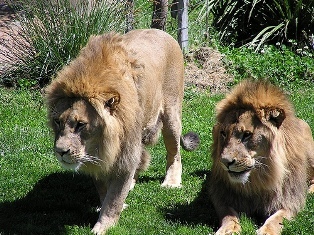 There are tours three times a week, bookings are required. South of the Lake Burley Griffin are some nice suburbs like Manuka and Kingston, with the Old Bus Depot Markets - a lovely place to shop away. North of the Lake Burley Griffin is Canberra city centre, with lots of shops, bars and restaurants north of the Vernon Circle. East of the city centre is Canberra's University - Australian National University, and further east are the Australian National Botanic Gardens with different species of plants including the Eucalypt Lawn with over 600 species of eucalypts and Rainforest Gully where there is a 1km Aboriginal Plant Use Walk. There are free guided walks departing from the Visitors Centre. East of the Botanic Gardens are Black Mountain and Telstra Tower where there are good views over the city, and the National Zoo and Aquarium, with fauna from Australia and all over the world. If you are time pressed you can join a one hour tour to see the whole Canberra, and if you have more time you can catch a hop-on-hop-off sightseeing bus. There are also cruises on Lake Burley Griffin, and trips to Tidbinbilla and Namadgi. Lake Burley Griffin. Poster by AllPosters. Click on thumbnail to buy. There are plenty of different accommodation options available in Canberra. 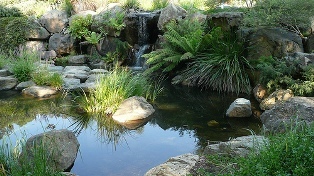 The places include Acacia Motor Lodge, Anzac Park Homestay, Avalanche Homestead Hotel, Bentley Suites, Best Western Garden City Hotel, Breakfree Capital Tower Hotel, City gateway Motel, Comfort Inn and Suites, Crowne Plaza Hotel, Diamant Hotel, Forrest Inn and Apartments, Griffin Hotel, Heritage Hotel, Kurrajong Hotel, Motor Village Hotel, Novotel Hotel, Parkway Motel, Pinnacle Apartment Hotel, Quest Apartments, Rydges Capital Hill Hotel, Sundowner Embassy Motel, The Chelsea Lodge and Wallaby Motel. For the full list of places to stay check out Canberra Accommodation. 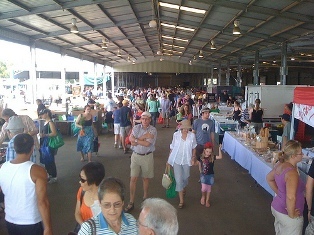 There are many festivals and celebrations organised in Canberra throughout the year. In January, there is the Summernats Car Festival. In February, there are the National Multicultural Festival and Royal Canberra Show. In March-April the there are Celebrate Canberra, National Folk Festival and Indy Fest. In September-October there is the famous Floriade, and in December there is the Metal for the Brain. Floriade. Poster by AllPosters. Click on thumbnail to buy. Here's a map of Canberra Australia, where I have tagged the places that I mentioned on this web page. You can click on the tags to see what places they are, and double-click anywhere on the map to zoom it in and see the places closer. Drag the map to move around, and if you want to see the satellite image with Google Earth, click on "Sat" in the top right hand corner.